It seemed like Christmas in July when I received these cartridges to review. They turned out to be excellent examples of the full capabilities of the VIC. Some may have received more play than others, but all were challenging and fun to use. I think most adults will be very pleased with their purchase, and the kids who are arcade game freaks will especially like two of them (Omega Race and Gorf). Sargon II Chess is more a thinking person's game, and Visible Solar System is an interesting educational tool. I am truly amazed at the ingenuity of machine language programmers. In the video games particularly, they use all the VIC's features. That is, color, sound, and graphics are integrated into a tour de force of gamesmanship – my word for their art. The programmers seem to be improving with each new release, so I hesitate to give numerical ratings as I am not sure what the future will hold. An alien race, the Omegans, run a contest to improve their fighting skills. You are an Omegan fighter, and the command ship which you control must evade and destroy three types of enemy ships and two kinds of mines. Points are awarded for each ship and mine destroyed. 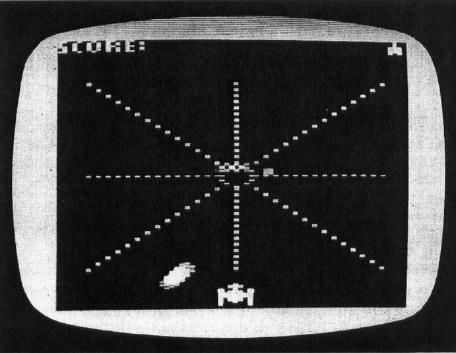 The contest is played between two concentric rectangles. 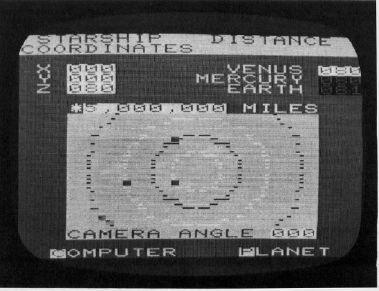 The central rectangle is impenetrable and displays the current score, the previous high, and the number of your remaining ships (turns). Force field boundaries, which resemble rubber bands, keep the players inside the outer rectangle. The game is very fast-moving and difficult to master. Enemy droid ships start out with limited fire power, but improve with time. They occasionally become enemy command ships which are more deadly and become even more so when they metamorphize into widely spinning death ships. Watch out for newly laid mines! 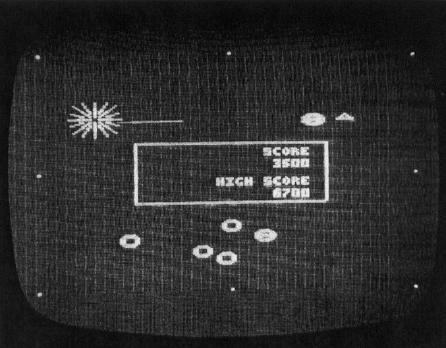 At the start of the game, you are given a choice of screen and character colors, three or five ships (turns), and either joystick or paddle control of your ship. I found paddle control easier to use, and my tiny testers agreed. I never scored very high, but one of the testers easily scored over 135,000 points starting with five men. 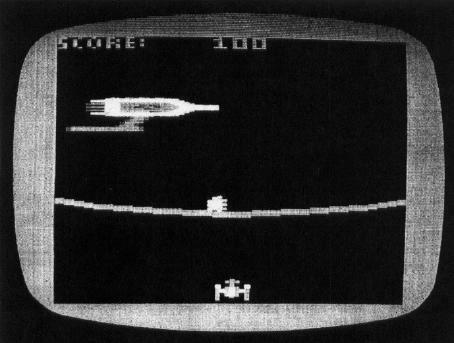 Many of the testers preferred this game over any of the others reviewed here. A real winner for the VIC. The Gorfian Empire poses a major threat to the Earth. Narrative translation: Get them before they get you, or you "bite the dust." Gorf really is four games in one. 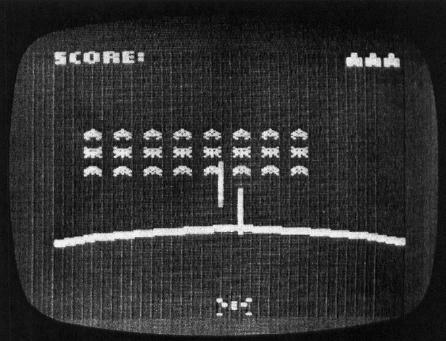 You are in control of a fighter under attack. The Gorfian attacks come in waves. 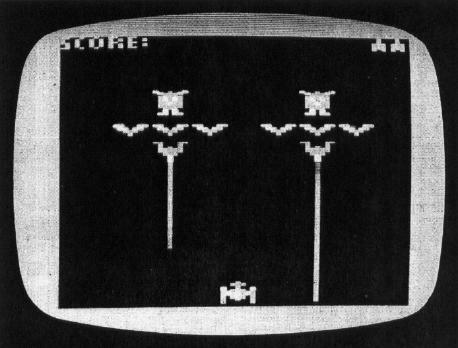 Wave 1 is called "Astro Battles" and is reminiscent of Space Invaders. Three rows of Droids, controlled by a Gorf, keep coming at you. You have some protection by a force field, but that doesn't last long. Kill or be killed is your motto throughout all the waves. Wave two, assuming you survive wave one, is called "Laser Attack." Two groups – a Gorf, three attack ships and a laser ship – have a serious grudge against you. Keep out of the way of the laser power ray, or you'll be sorry. The third wave, called "Space Warp," is the most difficult. The attacks come in a spiral formation and could make you dizzy if you watch too long. Avoid the smart torpedoes which seem to zero in on you. The flagship wave is the only remaining hurdle. You must destroy the flagship's power reactor while dodging fireballs and chips from the damaged vessel. The reward for completion of all four missions is a promotion and the right to oppose an even more powerful Gorfian force. I find this game fascinating to watch while an "expert" plays. You are in a different world. I can't seem to get past the first or second waves, but experts can evade the enemy for mission after mission. How do they do it? I have no explanation except to say that I have the same feeling of awe when I watch professional sports on television. Why can't I do that – it looks so easy? Chess is considered a more "serious" game. Parents who would object to their child playing a video game would probably not object to chess. Chess certainly requires more thinking than most games, although the video games do have their own best strategies. Many people feel that the thinking associated with chess is good for us, and could carry over into other areas. Whatever the case, Sargon II is both fun and thought-provoking at the same time, and cannot help but make more people interested in one of the world's oldest games. 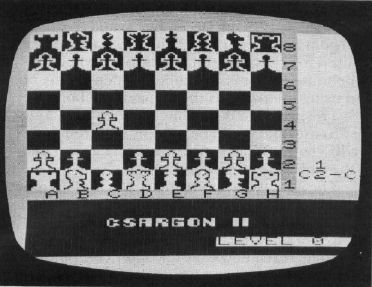 Sargon II probably has the best reputation of all the microcomputer chess programs. You are playing against the computer. At the start, you are given a choice of white or black pieces and the level of play. Beginners should choose level 1 or 0. Twenty seconds is given as the average response time for level 1. If you are a masochist, you can choose level 6, where the average response time is four hours! Of course, the play is much better at the highest levels as the computer is "thinking" further ahead. The chess board is displayed with stylized pieces, which take a little getting used to at first. After awhile there is no problem. The last five moves are shown in a box next to the board. The notation used to show moves is algebraic (E2-E4) as opposed to descriptive (P-K4). However, the capture of a piece and castling is shown by X and O. Moves can he made either by typing the from-to locations with the keyboard or with a joystick. In the latter case, the cursor is placed over the piece, which is then "picked up" and "set down" at the new location. It is possible to correct errors or try a chess problem with the set-up mode. I tried a few simple chess problems, with which Sargon II had no trouble. This mode could be used to correct the only deviation from normal chess rules that I could find – pawn promotion was always to a queen. At the higher levels, Sargon II will, at your request, tell you what it thinks is your best move. You are free to accept or reject this suggestion. It is usually a good suggestion! I would guess that this is the most sophisticated program available for the VIC. This program can hardly be called a game – it begins with a computer simulation of the solar system. 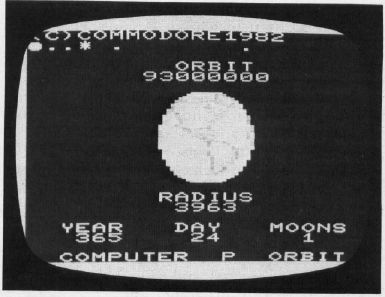 You are in command of a spaceship which is on a tour of a scaled model of the planets in orbit around the sun. Additional features include a section displaying descriptive models of each of four planets and an "astrocalc," which gives detailed facts about, the first six planets. Do not expect any unfriendly extra-terrestrials to appear when you use this program. If they do, turn off the VIC. I would expect this simulation to get more classroom than home use. Flying through space shows in realtime perspective what can only be read about in textbooks. You have complete control of the position of the spaceship in three dimensions. The screen shows what one would see from an operator-controlled television camera. It can be positioned to view at any angle in an arc of 180 degrees relative to the ship. It does take some practice to get a feel for the program, and the preliminary text that comes with the cartridge is quite helpful. However, I believe an experienced teacher would be even more so. In spite of my minor objections, Visible Solar System is the kind of program I would like to see more of. We have plenty of good games – I like to play them myself – but what we really need is more programs which can be used in teaching. They probably are more difficult to write effectively, and they may not sell as well, but they have a unique value.